Additional tickets will NOT be available at the bus. Please purchase all tickets 24hrs prior to the trip. Please fill out all information for the person who will be traveling. Please print the above table so you will know when the bus will leave from your bus stop. The departure time of the stop you select will not be printed on your ticket! 1. What do all these times mean? "TO SYRACUSE AIRPORT" means going to the airport or train station. The arrival time is the time the bus will get TO THE AIRPORT. "FROM SYRACUSE AIRPORT" means coming back to the Cornell University Ithaca Campus. The departure time is the time that the bus will LEAVE THE AIRPORT. 2. Where can I get on the bus in Ithaca? The bus stops at the following three (3) locations for passengers to board: Robert Purcell Community Center on North Campus (at the bus stop near George Jameson Hall), the Baker Flagpole on West Campus (at the bus stop), and the Schwartz Center for the Performing Arts in Collegetown (at the bus stop). 3. Where can I get on the bus in Syracuse? 4. Do buses run at other times during the semester besides the breaks? 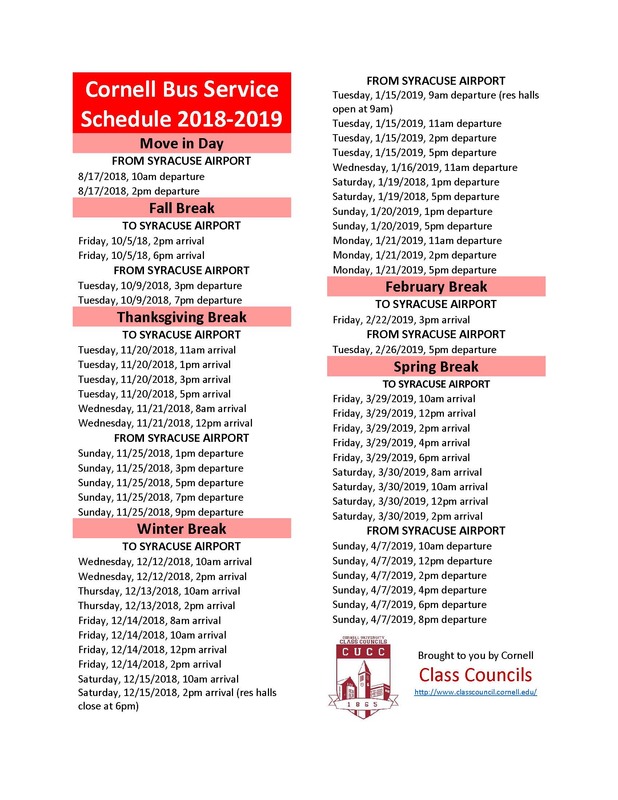 No, the buses ONLY run during certain times of move in day, fall break, Thanksgiving break, winter break, february break, and spring break. There are no summer buses or buses on weekends without breaks. We will not add buses to the schedule after the schedule has gone up for the year. 5. Why don't I see a $40 refundable ticket? The $40 ticket is really just a $30 ticket and the $10 insurance. Also, if you buy 2 tickets and you want them both to be refundable, you need to purchase insurance for both (which would be $20). 6. I missed my bus. May I please get a refund? We offer refunds for passengers who have purchased the insurance for their trips. If you have done this, you may get a refund IF, (1) your flight was delayed, (2) your flight was changed, or (3) your flight was cancelled. Note: if a bus has low numbers, it can be canceled and you will get a full refund and a comp ticket for a future ride.